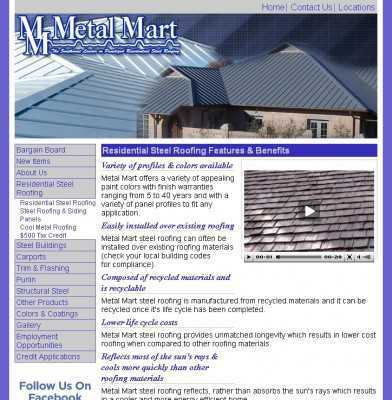 Metal Mart was founded in 1985 as a single retail store near Austin, Texas. 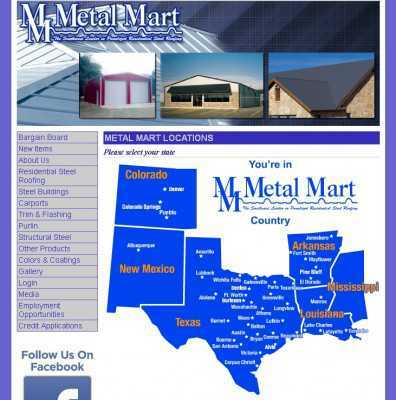 The brand expanded and expanded, until Metal Mart stores became well-known not only all over Texas, but also in the nearby States of New Mexico, Arkansas, Colorado, Mississippi and Louisiana. And you can find the store that is the closest to where you live, and see all the products that you’ll be able to buy there on this site, www.metalmarts.com (notice the extra “s”). MetalMarts.com is an easy-to-explore website where you can check the company’s entire line of products. “Colors & Coatings”, “Trim & Flashing”, “Purlin”, “Structural Steel”, “Residential Steel Roofing”… these are all available categories. And so is one called “Bargain Board”, where you can browse through all the items that are on sale. And a print catalog can be requested here, if you’re one for shopping in a more old-fashioned way, or if you have to shop with some senior relatives who are not that well-acquainted with technology. And in case you need to get in touch with a company member, representative, or salesman, then you can quickly find the necessary information on the site’s “Contact Us” page. Of course, you can also follow the company on Facebook and ask all your questions right there.